Justin Timberlake has defended Pink for cancelling a gig after being spotted relaxing on an Australian beach. She called off the performance on her Beautiful Trauma tour in Sydney after coming down with a chest infection. The 38-year-old had been snapped by paparazzi photographers enjoying a day with her family on a beach in Byron. Speculation followed about why she’d cancelled prompting Pink to respond on Instagram. He went on to say he related to what Pink was going through – as he struggles with his own health. “And NOW… as a parent on tour as well, and an artist who LOVES their fans just as much and wants to give them an unprecedented experience… AND is currently battling an injury, a sinus infection, and trying to be the DAD I want to be too?? He criticised the paparazzi photographers who took the beach pictures and wished Pink a speedy recovery. “Go make up some fodder about somebody who’s half-assin’ it. NOT a real one. “Wishing you full health and speedy recovery, Pink! Shine on, sis!!!!! — JT,” he ended. 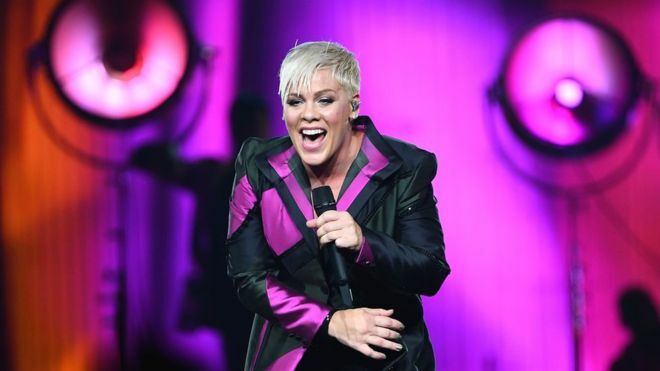 Pink originally called off the tour date on 3 August posting an apology on Twitter and then asking for recommendations on where to get wellness shots and juices in Sydney. It’s not the first time Pink has been forced to cancel gigs due to ill health. In March this year she dropped her Detroit gig because of issues with her voice. But, the singer has promised to reschedule the cancelled Sydney date later on during her tour and has resumed all her other dates including one for tonight in the city.